momstown Winnipeg: Ahoy Matey! 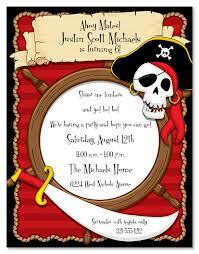 How to Have a Pirate Themed Party! Saturday was Braxton’s third birthday. 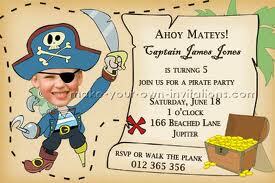 To celebrate, we threw a pirate party. Braxton wanted to wear a striped orange shirt and blue shorts – perfect pirate attire. We chose to keep the party small, 4 friends, 1 brother and the birthday boy. For decorations, I used general “pirate” stuff – a treasure map tablecloth, black, blue and red balloons and homemade banner. As the children arrived, I gave them bandannas, eyepatches, swords, and they decorated a parrot, that can be found here. Then we played a few games, read the book Shiver Me Letters: A Pirate’s ABC, had free play, ate lunch, went on a treasure/scavenger hunt, ate cake, and opened presents. Sailboats – egg salad served in halved red peppers. find recipe here. For activities, I tried to incorporate the pirate theme. 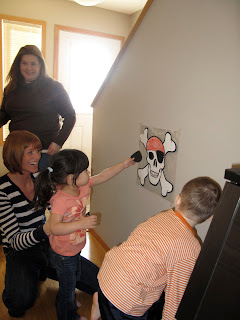 We played “Pin the Eyepatch on the Skull & Crossbones. A treasure/scavenger hunt for their goody bags. 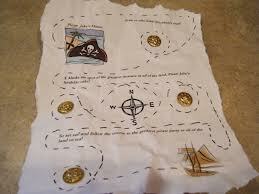 I wrote the clues in pirate lingo, but since the kids were 2-4 years old I also had a picture clue on the reverse side. For the goody bags, print out your own labels, filled brown paper lunch sacks and tied them with brown raffia ribbon to make them look like loot sacks. The cake I found online and can be found here. It was a great party, I feel the kids and moms had a great time!